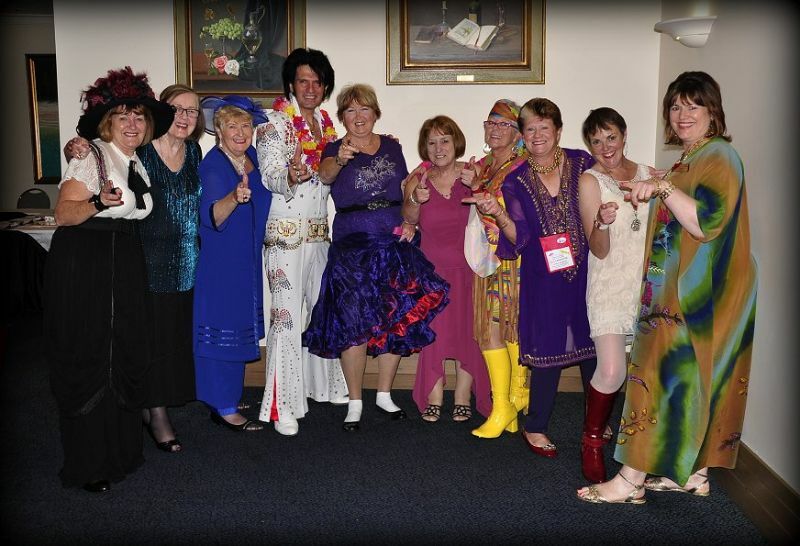 Fashions Thru the Ages was the second convention organized by Down Under Scarlett Belles chapter. 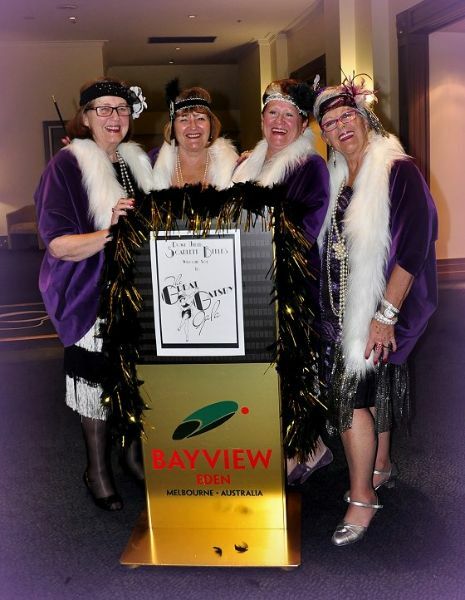 It was held at the Bayview hotel in Melbourne and attended by chapters from interstate country and local suburbs At registration each lady was presented with a red neck pouch containing tickets for various events along with a bottle of monogrammed water with a tiny red hat on top. 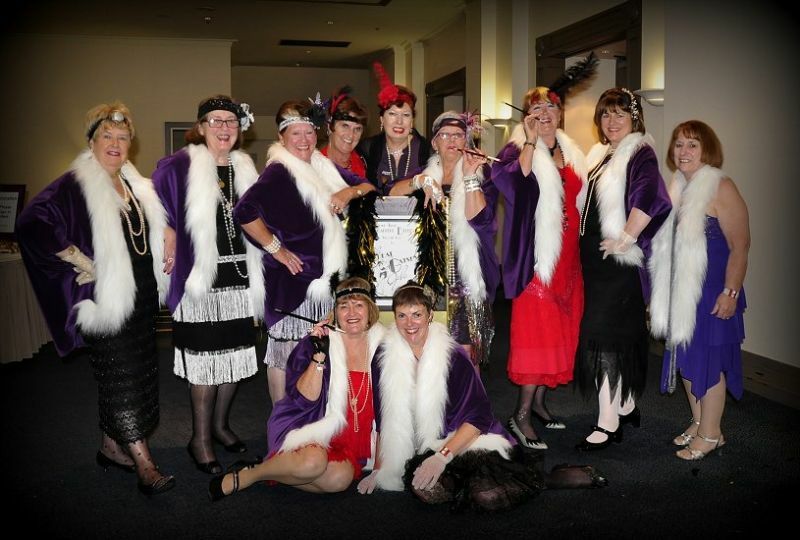 The first night got off to a roaring start with canapés served in the foyer to the ladies all decked out in their finest roaring 20’s dresses and head pieces. Entering the ballroom the ladies were treated to a beautiful black n white decor with black and gold balloons above the dance floor and Gatsby posters all around. Next morning it was breakfast in the Niche restaurant downstairs and then a scurry of activity for the ladies to catch taxis, trams or walk into Melbourne city. Fifty ladies boarded the tram boat restaurant cruise for a three hour trip down the Yarra river, even after a huge breakfast the ladies fitted in a coffee with a slice or two to nibble on until lunch stop. Each lady had a Gatsby print on their placemats and one lady on each table won a necklace and ear ring set. For each lady there was a small black and white gift box of little soaps, a lotus flower with a purple heart chocolate and a tiny silver shoe book mark. Prizes were never in short supply and as they say Winners are Grinners, and there were a lot of grinners on that night. 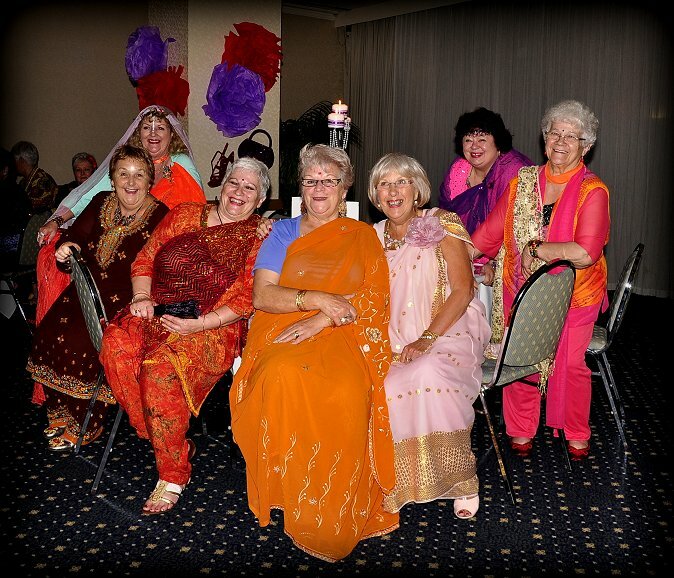 The ladies danced the night away to Duo, a two piece band who played all our favourite songs to dance to. Each lady received gifts on the table. Fifty ladies boarded the tram boat restaurant cruise for a three hour trip down the Yarra river, even after a huge breakfast the ladies fitted in a coffee with a slice or two to nibble on until lunch stop. Lunch was a boxed pack of fish and chips , so fresh and tasty the ladies had no option but to eat it all. No trip out is complete for red hatters unless there is a bit of shopping time so after an hour shopping the ladies boarded the tram boat back to the dock to disembark, while other ladies took the opportunity to shop in Melbourne , go to the Victoria Market, the Art gallery , some ladies took in a movie or matinee show or tried their luck at the casino. Saturday night was in full swing with another sumptuous 3 course meal, dancing to the songs and music of Frankie Stevens. 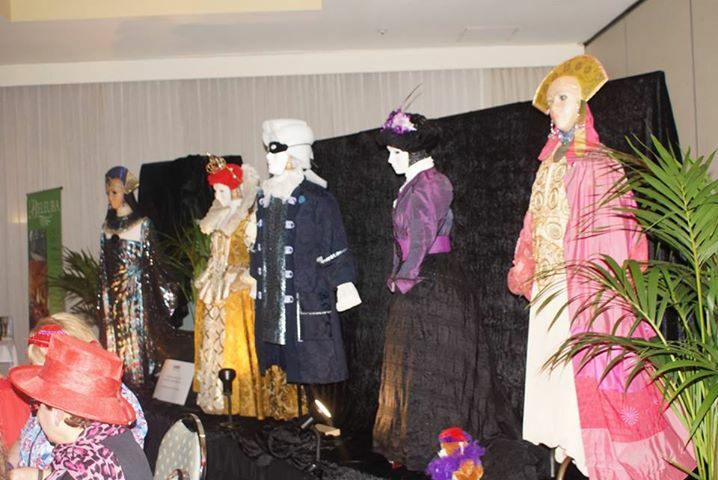 The room was decorated in red and purple colours with a display of clothing from different era’s. These clothes were on loan and displayed by Beluera House in Mt Eliza. Volunteer Heather and her helpers gave up their weekend to bring the clothes into Bayview and set them up professionally, Heather also asked her husband to make masks and faces for each of the mannequins.We are so grateful to Beluera and their staff for their generosity . Saturday nights placemats displayed Fashions thru many ages and were the topic of lots of conversations about the styles of clothing over the years. Although we think we can dance and sing like we did when we were 18 it was nice to have the interruption of a floor show. All seated to await the arrival of Elvis, and although not the real deal the ladies didn’t seem to notice and were happy to be sung to , touched by Elvis or be chosen to dance with him, so after Elvis dressed in his white jewelled tight trousers, another show followed with Elvis in his tight black pants, not sure what we concentrated on most, Elvis in his black pants or his singing., but both were extremely enjoyable. More gifts on the table, this time gorgeous little purple cardboard shoes containing red jelly beans, and an engraved little torch. More gifts and more winners. One lucky lady each night won a free night’s accommodation also hampers, gift packs , wine packs and other goodies. After Elvis left the building it was back to the dance floor to use what little energy we had left before departing for bed and a few hours sleep. Sunday morning up but not all bright and bushy tailed but ready for breakfast and a last farewell chat. The ladies received a lovely red bracelet and a free raffle ticket and a farewell breakfast placemat. After breakfast speeches , thank you’s and announcements for upcoming conventions , all ladies stood for the Farewell red Hat sister song. 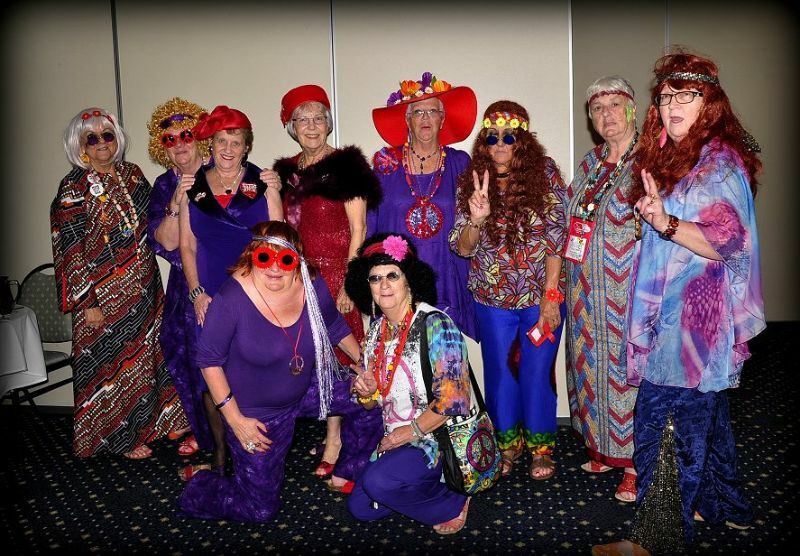 This was a moving moment and most ladies enjoyed the soothing slowness of the song, the words written especially for Red Hatters and the music especially written and song sung by the original writer for the Down Under Scarlett Belles convention. A meeting for the Queens Vice Queens and other royal court ladies was held and conducted by Vivienne Queen Travelot, issues were discussed , suggestions made by various chapters and their Queens and advice offered to Queens for questions asked. The announcement of the thirds trilogy of Down Under Scarlett Belles conventions was announced. Memories Thru the Ages to be held in Feb/March 2017. Theme will be Friday night “ Boot Scootin Cowgirl “ and Saturday night will be Memories Thru the Ages” Sunday breakfast will have a surprise theme. So ladies start working on your favourite “Memories” “ ie, come dressed as a school girl if school was your favourite, a nurse if that was your job, hippy , or your wedding or debutante, rock n roll, a mother , housewife if that is your favourite memory , or a favourite tv show. We grew up in such a changing era we have memories of the “olden “ days and the new generation era . We hope to see you all again and more chapters at our next convention. Thankyou for your support from Queen Travelot ( Vivienne) and the Down Under Scarlett Belles.